If you need a holiday gift idea for the family genealogist on your list, you might want to read my quick guide to canvas photo printing services in the December 2013 Family Tree Magazine. Most digital photo printing services now offer the ability to have photos printed on stretched or rolled canvas. The photo canvases provide a neat and relatively inexpensive (depending on the size) way to give photos a professional, artwork-like quality to spruce up your walls. If you have an image (in a JPG format, for example) of your family tree, you could have it printed so the family historian can hang it on his or her wall, or you could have special family photos printed on the canvas. Of the six services highlighted in the Family Tree Magazine article, only one—Shutterfly—offers a cool family tree layout (for up to eight photos). To learn more about the differences among canvas photo printing services, check out the December 2013 Family Tree Magazine (page 64). Before I entered the world of higher education communications and marketing, I was an assistant editor at Family Tree Magazine. Working at this magazine started a new passion to research my own family history. I continue to research my family history today, and I continue to write (and sometimes edit) article for the magazine. 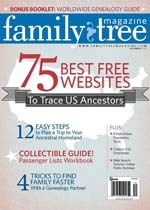 So far in 2013, Family Tree Magazine has published three articles I’ve written about technology tools for genealogists—a software review on Saving Memories Forever, a quick guide to tablet computers, and a quick guide on password managers. The Saving Memories Forever software review is available online (subscription required) and the quick guides are available as digital downloads in the magazine’s online store.